The fully automatic Jörg beading machine is designed for the fast and efficient processing of three to six metre lengths of zinc, copper, plasticol, etc. The machine offers a high level of user friendliness. The machine is equipped with a powerful motor and at an ideal height, so that the operator always has a good overview of the beading process. This, among other things, makes working with this machine quick and safe. The configuration of the beading bar and the flexible drive of the beading rod are unique. This creates a reliable beading process with few failures and good discharge. The hardened chrome infeed side of the beading bars prevents scratches on zinc. Heavy and sturdy construction for long and reliable use. Water barrier: Besides beading, the machine can also be used to make a water barrier on the sheet. Quick-change system: Another advantage of the Jörg beading machines is the option to mount four different beading bars on a rotating beam. The change over time from one diameter to another is less than 1 minute. Input unit with corner cutters: Another option is an input unit with integrated corner cutters. 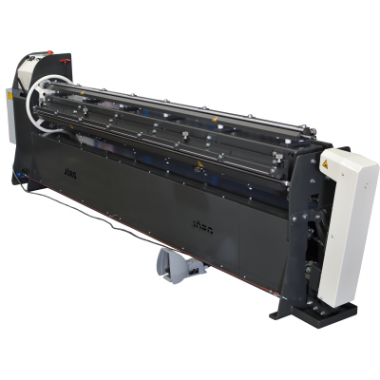 This unit increases the productivity, because a sheet can be fed into the beading machine by a single person. PLC control: The machine is controlled by a PLC for reliable and accurate functioning! Designed by JÖRG, Made in the Netherlands!